The Qt namespace contains miscellaneous identifiers used throughout the Qt library. This enum type is used to describe alignment. It contains horizontal and vertical flags that can be combined to produce the required effect. The TextElideMode enum can also be used in many situations to fine-tune the appearance of aligned text. Qt::AlignLeft 0x0001 Aligns with the left edge. Qt::AlignRight 0x0002 Aligns with the right edge. Qt::AlignHCenter 0x0004 Centers horizontally in the available space. Qt::AlignJustify 0x0008 Justifies the text in the available space. Qt::AlignTop 0x0020 Aligns with the top. Qt::AlignBottom 0x0040 Aligns with the bottom. Qt::AlignVCenter 0x0080 Centers vertically in the available space. Qt::AlignCenter AlignVCenter | AlignHCenter Centers in both dimensions. You can use at most one horizontal and one vertical flag at a time. Qt::AlignCenter counts as both horizontal and vertical. Qt::AlignAbsolute 0x0010 If the widget's layout direction is Qt::RightToLeft (instead of Qt::LeftToRight, the default), Qt::AlignLeft refers to the right edge and Qt::AlignRight to the left edge. This is normally the desired behavior. If you want Qt::AlignLeft to always mean "left" and Qt::AlignRight to always mean "right", combine the flag with Qt::AlignAbsolute. Qt::AlignLeading AlignLeft Synonym for Qt::AlignLeft. Qt::AlignTrailing AlignRight Synonym for Qt::AlignRight. Conflicting combinations of flags have undefined meanings. The Alignment type is a typedef for QFlags<AlignmentFlag>. It stores an OR combination of AlignmentFlag values. Qt::AnchorName 0 the name attribute of the anchor. This attribute is used when scrolling to an anchor in the document. Qt::AnchorHref 1 the href attribute of the anchor. This attribute is used when a link is clicked to determine what content to load. This enum describes attributes that change the behavior of application-wide features. These are enabled and disabled using QCoreApplication::setAttribute(), and can be tested for with QCoreApplication::testAttribute(). Qt::AA_ImmediateWidgetCreation 0 Ensures that widgets are created as soon as they are constructed. By default, resources for widgets are allocated on demand to improve efficiency and minimize resource usage. Setting or clearing this attribute affects widgets constructed after the change. Setting it tells Qt to create toplevel windows immediately. Therefore, if it is important to minimize resource consumption, do not set this attribute. Qt::AA_MSWindowsUseDirect3DByDefault 1 Is a Windows specific attribute, that will make the Direct3D paint engine the default Qt widget paint engine. Note that you can toggle usage of the Direct3D engine on individual QWidgets by setting/clearing the WA_MSWindowsUseDirect3D attribute on a specific widget. This functionality is experimental. Qt::AA_DontShowIconsInMenus 2 Actions with the Icon property won't be shown in any menus unless specifically set by the QAction::iconVisibleInMenu property. Menus that are currently open or menus already created in the native Mac OS X menubar MAY NOT pick up a change in this attribute. Changes in the QAction::iconVisibleInMenu property will always be picked up. Qt::AA_NativeWindows 3 Ensures that widgets have native windows. Qt::AA_DontCreateNativeWidgetSiblings 4 Ensures that siblings of native widgets stay non-native unless specifically set by the Qt::WA_NativeWindow attribute. This enum type defines what happens to the aspect ratio when scaling an rectangle. Qt::IgnoreAspectRatio 0 The size is scaled freely. The aspect ratio is not preserved. Qt::KeepAspectRatio 1 The size is scaled to a rectangle as large as possible inside a given rectangle, preserving the aspect ratio. Qt::KeepAspectRatioByExpanding 2 The size is scaled to a rectangle as small as possible outside a given rectangle, preserving the aspect ratio. See also QSize::scale() and QImage::scaled(). This enum type defines three values to represent the three axes in the cartesian coordinate system. Qt::XAxis 0 The X axis. Qt::YAxis 1 The Y axis. Qt::ZAxis 2 The Z axis. See also QTransform::rotate() and QTransform::rotateRadians(). This enum type defines the brush styles supported by Qt, i.e. the fill pattern of shapes drawn using QPainter. Qt::NoBrush 0 No brush pattern. Qt::Dense1Pattern 2 Extremely dense brush pattern. Qt::Dense2Pattern 3 Very dense brush pattern. Qt::Dense3Pattern 4 Somewhat dense brush pattern. Qt::Dense4Pattern 5 Half dense brush pattern. Qt::Dense5Pattern 6 Somewhat sparse brush pattern. Qt::Dense6Pattern 7 Very sparse brush pattern. Qt::Dense7Pattern 8 Extremely sparse brush pattern. Qt::CrossPattern 11 Crossing horizontal and vertical lines. Qt::BDiagPattern 12 Backward diagonal lines. Qt::FDiagPattern 13 Forward diagonal lines. Qt::DiagCrossPattern 14 Crossing diagonal lines. 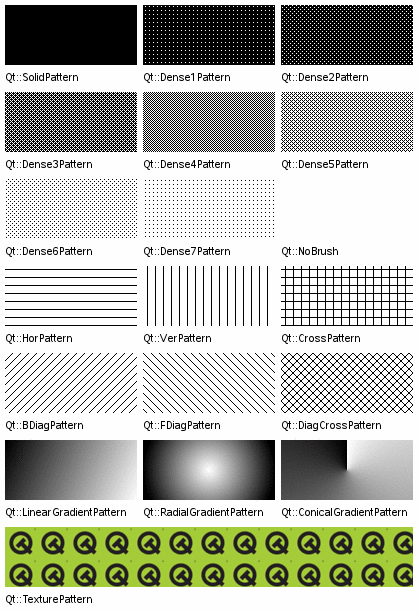 Qt::LinearGradientPattern 15 Linear gradient (set using a dedicated QBrush constructor). Qt::ConicalGradientPattern 17 Conical gradient (set using a dedicated QBrush constructor). Qt::RadialGradientPattern 16 Radial gradient (set using a dedicated QBrush constructor). Qt::TexturePattern 24 Custom pattern (see QBrush::setTexture()). This enum describes the state of checkable items, controls, and widgets. Qt::Unchecked 0 The item is unchecked. Qt::PartiallyChecked 1 The item is partially checked. Items in hierarchical models may be partially checked if some, but not all, of their children are checked. Qt::Checked 2 The item is checked. See also QCheckBox, Qt::ItemFlags, and Qt::ItemDataRole. Qt::NoClip 0 This operation turns clipping off. Qt::ReplaceClip 1 Replaces the current clip path/rect/region with the one supplied in the function call. Qt::IntersectClip 2 Intersects the current clip path/rect/region with the one supplied in the function call. Qt::UniteClip 3 Unites the current clip path/rect/region with the one supplied in the function call. Qt::DirectConnection 1 When emitted, the signal is immediately delivered to the slot. Qt::QueuedConnection 2 When emitted, the signal is queued until the event loop is able to deliver it to the slot. Qt::BlockingQueuedConnection 4 Same as QueuedConnection, except that the current thread blocks until the slot has been delivered. This connection type should only be used for receivers in a different thread. Note that misuse of this type can lead to dead locks in your application. Qt::AutoConnection 0 If the signal is emitted from the thread in which the receiving object lives, the slot is invoked directly, as with Qt::DirectConnection; otherwise the signal is queued, as with Qt::QueuedConnection. See also Thread Support in Qt, QObject::connect(), and qRegisterMetaType(). This enum type defines the various policies a widget can have with respect to showing a context menu. Qt::NoContextMenu 0 the widget does not feature a context menu, context menu handling is deferred to the widget's parent. Qt::PreventContextMenu 4 the widget does not feature a context menu, and in contrast to NoContextMenu, the handling is not deferred to the widget's parent. This means that all right mouse button events are guaranteed to be delivered to the widget itself through mousePressEvent(), and mouseReleaseEvent(). Qt::DefaultContextMenu 1 the widget's QWidget::contextMenuEvent() handler is called. Qt::ActionsContextMenu 2 the widget displays its QWidget::actions() as context menu. Qt::CustomContextMenu 3 the widget emits the QWidget::customContextMenuRequested() signal. Qt::TopLeftCorner 0x00000 The top-left corner of the rectangle. Qt::TopRightCorner 0x00001 The top-right corner of the rectangle. Qt::BottomLeftCorner 0x00002 The bottom-left corner of the rectangle. Qt::BottomRightCorner 0x00003 The bottom-right corner of the rectangle. This enum type defines the various cursors that can be used. The standard arrow cursor is the default for widgets in a normal state. Qt::ArrowCursor 0 The standard arrow cursor. Qt::UpArrowCursor 1 An arrow pointing upwards toward the top of the screen. 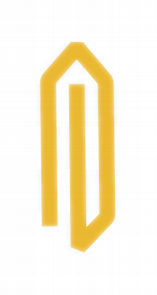 Qt::CrossCursor 2 A crosshair cursor, typically used to help the user accurately select a point on the screen. Qt::WaitCursor 3 An hourglass or watch cursor, usually shown during operations that prevent the user from interacting with the application. Qt::IBeamCursor 4 A caret or ibeam cursor, indicating that a widget can accept and display text input. Qt::SizeVerCursor 5 A cursor used for elements that are used to vertically resize top-level windows. Qt::SizeHorCursor 6 A cursor used for elements that are used to horizontally resize top-level windows. Qt::SizeBDiagCursor 7 A cursor used for elements that are used to diagonally resize top-level windows at their top-right and bottom-left corners. Qt::SizeFDiagCursor 8 A cursor used for elements that are used to diagonally resize top-level windows at their top-left and bottom-right corners. Qt::SizeAllCursor 9 A cursor used for elements that are used to resize top-level windows in any direction. Qt::BlankCursor 10 A blank/invisible cursor, typically used when the cursor shape needs to be hidden. Qt::SplitVCursor 11 A cursor used for vertical splitters, indicating that a handle can be dragged horizontally to adjust the use of available space. Qt::SplitHCursor 12 A cursor used for horizontal splitters, indicating that a handle can be dragged vertically to adjust the use of available space. Qt::PointingHandCursor 13 A pointing hand cursor that is typically used for clickable elements such as hyperlinks. Qt::ForbiddenCursor 14 A slashed circle cursor, typically used during drag and drop operations to indicate that dragged content cannot be dropped on particular widgets or inside certain regions. Qt::OpenHandCursor 17 A cursor representing an open hand, typically used to indicate that the area under the cursor is the visible part of a canvas that the user can click and drag in order to scroll around. Qt::ClosedHandCursor 18 A cursor representing a closed hand, typically used to indicate that a dragging operation is in progress that involves scrolling. Qt::WhatsThisCursor 15 An arrow with a question mark, typically used to indicate the presence of What's This? help for a widget. Qt::BusyCursor 16 An hourglass or watch cursor, usually shown during operations that allow the user to interact with the application while they are performed in the background. Qt::TextDate 0 The default Qt format. The day and month names will be localized names. See QDate::toString() for more information. Qt::ISODate 1 ISO 8601 extended format: either YYYY-MM-DD for dates or YYYY-MM-DDTHH:MM:SS for combined dates and times. Qt::SystemLocaleShortDate ? The short format used by the operating system. Qt::SystemLocaleLongDate ? The long format used by the operating system. Qt::DefaultLocaleShortDate ? The short format specified by the application's locale. Qt::DefaultLocaleLongDate ? The long format used by the application's locale. Qt::SystemLocaleDate 2 This enum value is deprecated. Use Qt::SystemLocaleShortDate instead (or Qt::SystemLocaleLongDate if you want long dates). Qt::LocaleDate ? This enum value is deprecated. Use Qt::DefaultLocaleShortDate instead (or Qt::DefaultLocaleLongDate if you want long dates). Qt::LocalDate SystemLocaleDate This enum value is deprecated. Use Qt::SystemLocaleShortDate instead (or Qt::SystemLocaleLongDate if you want long dates). Note: For ISODate formats, each Y, M and D represents a single digit of the year, month and day used to specify the date. Each H, M and S represents a single digit of the hour, minute and second used to specify the time. The presence of a literal T character is used to separate the date and time when both are specified. The DockWidgetAreas type is a typedef for QFlags<DockWidgetArea>. It stores an OR combination of DockWidgetArea values. Qt::CopyAction 0x1 Copy the data to the target. Qt::MoveAction 0x2 Move the data from the source to the target. Qt::LinkAction 0x4 Create a link from the source to the target. Qt::IgnoreAction 0x0 Ignore the action (do nothing with the data). The DropActions type is a typedef for QFlags<DropAction>. It stores an OR combination of DropAction values. This enum can be used to specify event priorities. Qt::HighEventPriority 1 Events with this priority are sent before events with NormalEventPriority or LowEventPriority. Qt::NormalEventPriority 0 Events with this priority are sent after events with HighEventPriority, but before events with LowEventPriority. Qt::LowEventPriority -1 Events with this priority are sent after events with HighEventPriority or NormalEventPriority. Specifies which method should be used to fill the paths and polygons. Qt::OddEvenFill 0 Specifies that the region is filled using the odd even fill rule. With this rule, we determine whether a point is inside the shape by using the following method. Draw a horizontal line from the point to a location outside the shape, and count the number of intersections. If the number of intersections is an odd number, the point is inside the shape. This mode is the default. Qt::WindingFill 1 Specifies that the region is filled using the non zero winding rule. With this rule, we determine whether a point is inside the shape by using the following method. Draw a horizontal line from the point to a location outside the shape. Determine whether the direction of the line at each intersection point is up or down. The winding number is determined by summing the direction of each intersection. If the number is non zero, the point is inside the shape. This fill mode can also in most cases be considered as the intersection of closed shapes. This enum type defines the various policies a widget can have with respect to acquiring keyboard focus. Qt::TabFocus 0x1 the widget accepts focus by tabbing. Qt::ClickFocus 0x2 the widget accepts focus by clicking. Qt::StrongFocus TabFocus | ClickFocus | 0x8 the widget accepts focus by both tabbing and clicking. On Mac OS X this will also be indicate that the widget accepts tab focus when in 'Text/List focus mode'. Qt::WheelFocus StrongFocus | 0x4 like Qt::StrongFocus plus the widget accepts focus by using the mouse wheel. Qt::NoFocus 0 the widget does not accept focus. This enum specifies why the focus changed. It will be passed through QWidget::setFocus and can be retrieved in the QFocusEvent sent to the widget upon focus change. Qt::MouseFocusReason 0 A mouse action occurred. Qt::TabFocusReason 1 The Tab key was pressed. Qt::BacktabFocusReason 2 A Backtab occurred. The input for this may include the Shift or Control keys; e.g. Shift+Tab. Qt::ActiveWindowFocusReason 3 The window system made this window either active or inactive. Qt::PopupFocusReason 4 The application opened/closed a pop-up that grabbed/released the keyboard focus. Qt::MenuBarFocusReason 6 The menu bar took focus. Qt::OtherFocusReason 7 Another reason, usually application-specific. Platform-specific handle type for system objects. This is equivalent to void * on Windows and Mac OS X, and embedded Linux, and to unsigned long on X11. Warning: Using this type is not portable. This enum contains the types of accuracy that can be used by the QTextDocument class when testing for mouse clicks on text documents. Qt::ExactHit 0 The point at which input occurred must coincide exactly with input-sensitive parts of the document. Qt::FuzzyHit 1 The point at which input occurred can lie close to input-sensitive parts of the document. This enum is defined in the <QTextDocument> header file. Qt::AutoColor 0x00000000 (default) - If the image has depth 1 and contains only black and white pixels, the pixmap becomes monochrome. Qt::ColorOnly 0x00000003 The pixmap is dithered/converted to the native display depth. Qt::MonoOnly 0x00000002 The pixmap becomes monochrome. If necessary, it is dithered using the chosen dithering algorithm. Qt::DiffuseDither 0x00000000 (default) - A high-quality dither. Qt::OrderedDither 0x00000010 A faster, more ordered dither. Qt::ThresholdDither 0x00000020 No dithering; closest color is used. Qt::ThresholdAlphaDither 0x00000000 (default) - No dithering. Qt::OrderedAlphaDither 0x00000004 A faster, more ordered dither. Qt::DiffuseAlphaDither 0x00000008 A high-quality dither. Qt::PreferDither 0x00000040 (default when converting to a pixmap) - Always dither 32-bit images when the image is converted to 8 bits. Qt::AvoidDither 0x00000080 (default when converting for the purpose of saving to file) - Dither 32-bit images only if the image has more than 256 colors and it is being converted to 8 bits. The ImageConversionFlags type is a typedef for QFlags<ImageConversionFlag>. It stores an OR combination of ImageConversionFlag values. Qt::ImMicroFocus 0 The rectangle covering the area of the input cursor in widget coordinates. Qt::ImFont 1 The currently used font for text input. Qt::ImCursorPosition 2 The logical position of the cursor within the text surrounding the input area (see ImSurroundingText). Qt::ImSurroundingText 3 The plain text around the input area, for example the current paragraph. Qt::ImCurrentSelection 4 The currently selected text. Each item in the model has a set of data elements associated with it, each with its own role. The roles are used by the view to indicate to the model which type of data it needs. Qt::DisplayRole 0 The key data to be rendered (usually text). Qt::DecorationRole 1 The data to be rendered as a decoration (usually an icon). Qt::EditRole 2 The data in a form suitable for editing in an editor. Qt::ToolTipRole 3 The data displayed in the item's tooltip. Qt::StatusTipRole 4 The data displayed in the status bar. Qt::WhatsThisRole 5 The data displayed for the item in "What's This?" mode. Qt::SizeHintRole 13 The size hint for the item that will be supplied to views. Qt::FontRole 6 The font used for items rendered with the default delegate. Qt::TextAlignmentRole 7 The alignment of the text for items rendered with the default delegate. Qt::BackgroundRole 8 The background brush used for items rendered with the default delegate. Qt::BackgroundColorRole 8 This role is obsolete. Use BackgroundRole instead. Qt::ForegroundRole 9 The foreground brush (text color, typically) used for items rendered with the default delegate. Qt::TextColorRole 9 This role is obsolete. Use ForegroundRole instead. Qt::CheckStateRole 10 This role is used to obtain the checked state of an item (see Qt::CheckState). Qt::AccessibleTextRole 11 The text to be used by accessibility extensions and plugins, such as screen readers. Qt::AccessibleDescriptionRole 12 A description of the item for accessibility purposes. Qt::UserRole 32 The first role that can be used for application-specific purposes. Qt::NoItemFlags 0 It does not have any properties set. Qt::ItemIsSelectable 1 It can be selected. Qt::ItemIsEditable 2 It can be edited. Qt::ItemIsDragEnabled 4 It can be dragged. Qt::ItemIsDropEnabled 8 It can be used as a drop target. Qt::ItemIsUserCheckable 16 It can be checked or unchecked by the user. Qt::ItemIsEnabled 32 The user can interact with the item. Qt::ItemIsTristate 64 The item is checkable with three separate states. Note that checkable items need to be given both a suitable set of flags and an initial state, indicating whether the item is checked or not. This is handled automatically for model/view components, but needs to be explicitly set for instances of QListWidgetItem, QTableWidgetItem, and QTreeWidgetItem. The ItemFlags type is a typedef for QFlags<ItemFlag>. It stores an OR combination of ItemFlag values. This enum is used in QGraphicsItem, QGraphicsScene and QGraphicsView to specify how items are selected, or how to determine if a shapes and items collide. Qt::ContainsItemShape 0x0 The output list contains only items whose shape is fully contained inside the selection area. Items that intersect with the area's outline are not included. Qt::IntersectsItemShape 0x1 The output list contains both items whose shape is fully contained inside the selection area, and items that intersect with the area's outline. This is a common mode for rubber band selection. Qt::ContainsItemBoundingRect 0x2 The output list contains only items whose bounding rectangle is fully contained inside the selection area. Items that intersect with the area's outline are not included. Qt::IntersectsItemBoundingRect 0x3 The output list contains both items whose bounding rectangle is fully contained inside the selection area, and items that intersect with the area's outline. This method is commonly used for determining areas that need redrawing. See also QGraphicsScene::items(), QGraphicsScene::collidingItems(), QGraphicsView::items(), QGraphicsItem::collidesWithItem(), and QGraphicsItem::collidesWithPath(). The key names used by Qt. Qt::Key_Enter 0x01000005 Typically located on the keypad. Qt::Key_Control 0x01000021 On Mac OS X, this corresponds to the Command keys. Qt::Key_Meta 0x01000022 On Mac OS X, this corresponds to the Control keys. On Windows keyboards, this key is mapped to the Windows key. Qt::Key_AltGr 0x01001103 On Windows, when the KeyDown event for this key is sent, the Ctrl+Alt modifiers are also set. This enum describes the modifier keys. Qt::NoModifier 0x00000000 No modifier key is pressed. Qt::ShiftModifier 0x02000000 A Shift key on the keyboard is pressed. Qt::ControlModifier 0x04000000 A Ctrl key on the keyboard is pressed. Qt::AltModifier 0x08000000 An Alt key on the keyboard is pressed. Qt::MetaModifier 0x10000000 A Meta key on the keyboard is pressed. Qt::KeypadModifier 0x20000000 A keypad button is pressed. Qt::GroupSwitchModifier 0x40000000 X11 only. A Mode_switch key on the keyboard is pressed. Note: On Mac OS X, the ControlModifier value corresponds to the Command keys on the Macintosh keyboard, and the MetaModifier value corresponds to the Control keys. The KeypadModifier value will also be set when an arrow key is pressed as the arrow keys are considered part of the keypad. Note: On Windows Keyboards, Qt::MetaModifier and Qt::Key_Meta are mapped to the Windows key. The KeyboardModifiers type is a typedef for QFlags<KeyboardModifier>. It stores an OR combination of KeyboardModifier values. See also MouseButton and Modifier. Right-to-left layouts are necessary for certain languages, notably Arabic and Hebrew. See also QApplication::setLayoutDirection() and QWidget::setLayoutDirection(). This enum specifies the behavior of the QPixmap::createMaskFromColor() and QImage::createMaskFromColor() functions. Qt::MaskInColor 0 Creates a mask where all pixels matching the given color are opaque. Qt::MaskOutColor 1 Creates a mask where all pixels matching the given color are transparent. This enum describes the type of matches that can be used when searching for items in a model. Qt::MatchExactly 0 Performs QVariant-based matching. Qt::MatchFixedString 8 Performs string-based matching. String-based comparisons are case-insensitive unless the MatchCaseSensitive flag is also specified. Qt::MatchContains 1 The search term is contained in the item. Qt::MatchStartsWith 2 The search term matches the start of the item. Qt::MatchEndsWith 3 The search term matches the end of the item. Qt::MatchCaseSensitive 16 The search is case sensitive. Qt::MatchRegExp 4 Performs string-based matching using a regular expression as the search term. Qt::MatchWildcard 5 Performs string-based matching using a string with wildcards as the search term. Qt::MatchWrap 32 Perform a search that wraps around, so that when the search reaches the last item in the model, it begins again at the first item and continues until all items have been examined. Qt::MatchRecursive 64 Searches the entire hierarchy. The MatchFlags type is a typedef for QFlags<MatchFlag>. It stores an OR combination of MatchFlag values. See also QString::compare() and QRegExp. This enum provides shorter names for the keyboard modifier keys supported by Qt. Note: On Mac OS X, the CTRL value corresponds to the Command keys on the Macintosh keyboard, and the META value corresponds to the Control keys. Qt::SHIFT Qt::ShiftModifier The Shift keys provided on all standard keyboards. Qt::META Qt::MetaModifier The Meta keys. Qt::CTRL Qt::ControlModifier The Ctrl keys. Qt::ALT Qt::AltModifier The normal Alt keys, but not keys like AltGr. Qt::UNICODE_ACCEL 0x00000000 The shortcut is specified as a Unicode code point, not as a Qt Key. See also KeyboardModifier and MouseButton. This enum type describes the different mouse buttons. Qt::NoButton 0x00000000 The button state does not refer to any button (see QMouseEvent::button()). Qt::RightButton 0x00000002 The right button. Qt::MidButton 0x00000004 The middle button. Qt::XButton1 0x00000008 The first X button. Qt::XButton2 0x00000010 The second X button. The MouseButtons type is a typedef for QFlags<MouseButton>. It stores an OR combination of MouseButton values. See also KeyboardModifier and Modifier. This type is used to signify an object's orientation. Orientation is used with QScrollBar for example. The Orientations type is a typedef for QFlags<Orientation>. It stores an OR combination of Orientation values. This enum type defines the pen cap styles supported by Qt, i.e. the line end caps that can be drawn using QPainter. Qt::FlatCap 0x00 a square line end that does not cover the end point of the line. Qt::SquareCap 0x10 a square line end that covers the end point and extends beyond it by half the line width. Qt::RoundCap 0x20 a rounded line end. This enum type defines the pen join styles supported by Qt, i.e. which joins between two connected lines can be drawn using QPainter. Qt::MiterJoin 0x00 The outer edges of the lines are extended to meet at an angle, and this area is filled. Qt::BevelJoin 0x40 The triangular notch between the two lines is filled. Qt::RoundJoin 0x80 A circular arc between the two lines is filled. Qt::SvgMiterJoin 0x100 A miter join corresponding to the definition of a miter join in the SVG 1.2 Tiny specification. Qt::NoPen 0 no line at all. For example, QPainter::drawRect() fills but does not draw any boundary line. Qt::SolidLine 1 A plain line. Qt::DashLine 2 Dashes separated by a few pixels. Qt::DotLine 3 Dots separated by a few pixels. Qt::DashDotLine 4 Alternate dots and dashes. Qt::DashDotDotLine 5 One dash, two dots, one dash, two dots. Qt::CustomDashLine 6 A custom pattern defined using QPainterPathStroker::setDashPattern(). This enum type describes the various modes of QAbstractScrollArea's scroll bars. Qt::ScrollBarAsNeeded 0 QAbstractScrollArea shows a scroll bar when the content is too large to fit and not otherwise. This is the default. Qt::ScrollBarAlwaysOff 1 QAbstractScrollArea never shows a scroll bar. Qt::ScrollBarAlwaysOn 2 QAbstractScrollArea always shows a scroll bar. Qt::WidgetShortcut 0 The shortcut is active when its parent widget has focus. Qt::WidgetWithChildrenShortcut 3 The shortcut is active when its parent widget, or any of its children has focus. Children which are top-level widgets, except pop-ups, are not affected by this shortcut context. Qt::WindowShortcut 1 The shortcut is active when its parent widget is a logical subwidget of the active top-level window. Qt::ApplicationShortcut 2 The shortcut is active when one of the applications windows are active. Qt::MinimumSize 0 is used to specify the minimum size of a graphics layout item. Qt::PreferredSize 1 is used to specify the preferred size of a graphics layout item. Qt::MaximumSize 2 is used to specify the maximum size of a graphics layout item. Qt::MinimumDescent 3 is used to specify the minimum descent of a text string in a graphics layout item. This enum is used by QPainter::drawRoundedRect() and QPainterPath::addRoundedRect() functions to specify the radii of rectangle corners with respect to the dimensions of the bounding rectangles specified. Qt::AbsoluteSize 0 Specifies the size using absolute measurements. Qt::RelativeSize 1 Specifies the size relative to the bounding rectangle, typically using percentage measurements. This enum describes how the items in a widget are sorted. Qt::ElideLeft 0 The ellipsis should appear at the beginning of the text. Qt::ElideRight 1 The ellipsis should appear at the end of the text. Qt::ElideMiddle 2 The ellipsis should appear in the middle of the text. Qt::ElideNone 3 Ellipsis should NOT appear in the text. Qt::ElideMiddle is normally the most appropriate choice for URLs (e.g., "http://www.troll...ovingto/beijing/"), whereas Qt::ElideRight is appropriate for other strings (e.g., "Deploying Applications on Ma..."). See also QAbstractItemView::textElideMode, QFontMetrics::elidedText(), AlignmentFlag, and QTabBar::elideMode. Qt::TextSingleLine 0x0100 Treats all whitespace as spaces and prints just one line. Qt::TextDontClip 0x0200 If it's impossible to stay within the given bounds, it prints outside. Qt::TextExpandTabs 0x0400 Makes the U+0009 (ASCII tab) character move to the next tab stop. Qt::TextShowMnemonic 0x0800 Displays the string "&P" as P (see QButton for an example). For an ampersand, use "&&". Qt::TextWordWrap 0x1000 Breaks lines at appropriate points, e.g. at word boundaries. Qt::TextWrapAnywhere 0x2000 Breaks lines anywhere, even within words. Qt::TextHideMnemonic 0x8000 Same as Qt::TextShowMnemonic but doesn't draw the underlines. Qt::TextDontPrint 0x4000 Treat this text as "hidden" and don't print it. Qt::TextIncludeTrailingSpaces 0x08000000 Don't automatically delete trailing whitespace. Qt::TextJustificationForced 0x10000 Ensures that text lines are justified. You can use as many modifier flags as you want, except that Qt::TextSingleLine and Qt::TextWordWrap cannot be combined. Flags that are inappropriate for a given use are generally ignored. This enum is used in widgets that can display both plain text and rich text, e.g. QLabel. It is used for deciding whether a text string should be interpreted as one or the other. This is normally done by passing one of the enum values to a setTextFormat() function. Qt::PlainText 0 The text string is interpreted as a plain text string. Qt::RichText 1 The text string is interpreted as a rich text string. Qt::AutoText 2 The text string is interpreted as for Qt::RichText if Qt::mightBeRichText() returns true, otherwise as Qt::PlainText. Qt::LogText 3 A special, limited text format which is only used by Q3TextEdit in an optimized mode. This enum specifies how a text displaying widget reacts to user input. Qt::NoTextInteraction 0 No interaction with the text is possible. Qt::TextSelectableByMouse 1 Text can be selected with the mouse and copied to the clipboard using a context menu or standard keyboard shortcuts. Qt::TextSelectableByKeyboard 2 Text can be selected with the cursor keys on the keyboard. A text cursor is shown. Qt::LinksAccessibleByMouse 4 Links can be highlighted and activated with the mouse. Qt::LinksAccessibleByKeyboard 8 Links can be focused using tab and activated with enter. Qt::TextEditable 16 The text is fully editable. Qt::TextEditorInteraction TextSelectableByMouse | TextSelectableByKeyboard | TextEditable The default for a text editor. Qt::TextBrowserInteraction TextSelectableByMouse | LinksAccessibleByMouse | LinksAccessibleByKeyboard The default for QTextBrowser. The TextInteractionFlags type is a typedef for QFlags<TextInteractionFlag>. It stores an OR combination of TextInteractionFlag values. Qt::LocalTime 0 Locale dependent time (Timezones and Daylight Savings Time). Qt::UTC 1 Coordinated Universal Time, replaces Greenwich Mean Time. Qt::OffsetFromUTC 2 An offset in seconds from Coordinated Universal Time. The ToolBarAreas type is a typedef for QFlags<ToolBarArea>. It stores an OR combination of ToolBarArea values. The style of the tool button, describing how the button's text and icon should be displayed. Qt::ToolButtonIconOnly 0 Only display the icon. Qt::ToolButtonTextOnly 1 Only display the text. Qt::ToolButtonTextBesideIcon 2 The text appears beside the icon. Qt::ToolButtonTextUnderIcon 3 The text appears under the icon. This enum type defines whether image transformations (e.g., scaling) should be smooth or not. Qt::FastTransformation 0 The transformation is performed quickly, with no smoothing. Qt::SmoothTransformation 1 The resulting image is transformed using bilinear filtering. This enum describes the available UI effects. By default, Qt will try to use the platform specific desktop settings for each effect. Use the QApplication::setDesktopSettingsAware() function (passing false as argument) to prevent this, and the QApplication::setEffectEnabled() to enable or disable a particular effect. Note that all effects are disabled on screens running at less than 16-bit color depth. Qt::UI_AnimateMenu 1 Show animated menus. Qt::UI_FadeMenu 2 Show faded menus. Qt::UI_AnimateCombo 3 Show animated comboboxes. Qt::UI_AnimateTooltip 4 Show tooltip animations. Qt::UI_FadeTooltip 5 Show tooltip fading effects. See also QApplication::setEffectEnabled() and QApplication::setDesktopSettingsAware(). This enum describes the types of whitespace mode that are used by the QTextDocument class to meet the requirements of different kinds of textual information. Qt::WhiteSpaceNormal 0 The whitespace mode used to display normal word wrapped text in paragraphs. Qt::WhiteSpacePre 1 A preformatted text mode in which whitespace is reproduced exactly. This enum type is used to specify various widget attributes. Attributes are set and cleared with QWidget::setAttribute(), and queried with QWidget::testAttribute(), although some have special convenience functions which are mentioned below. Qt::WA_AcceptDrops 78 Allows data from drag and drop operations to be dropped onto the widget (see QWidget::setAcceptDrops()). Qt::WA_AlwaysShowToolTips 84 Enables tooltips for inactive windows. Qt::WA_ContentsPropagated 3 This flag is superfluous and obsolete; it no longer has any effect. Since Qt 4.1, all widgets that do not set WA_PaintOnScreen propagate their contents. Qt::WA_CustomWhatsThis 47 Indicates that the widget wants to continue operating normally in "What's This?" mode. This is set by the widget's author. Qt::WA_DeleteOnClose 55 Makes Qt delete this widget when the widget has accepted the close event (see QWidget::closeEvent()). Qt::WA_Disabled 0 Indicates that the widget is disabled, i.e. it does not receive any mouse or keyboard events. There is also a getter functions QWidget::isEnabled(). This is set/cleared by the Qt kernel. Qt::WA_ForceDisabled 32 Indicates that the widget is explicitly disabled, i.e. it will remain disabled even when all its ancestors are set to the enabled state. This implies WA_Disabled. This is set/cleared by QWidget::setEnabled() and QWidget::setDisabled(). Qt::WA_ForceUpdatesDisabled 59 Indicates that updates are explicitly disabled for the widget; i.e. it will remain disabled even when all its ancestors are set to the updates-enabled state. This implies WA_UpdatesDisabled. This is set/cleared by QWidget::setUpdatesEnabled(). Qt::WA_GroupLeader 72 This attribute has been deprecated. Use QWidget::windowModality instead. Qt::WA_Hover 74 Forces Qt to generate paint events when the mouse enters or leaves the widget. This feature is typically used when implementing custom styles; see the Styles example for details. Qt::WA_InputMethodEnabled 14 Enables input methods for Asian languages. Must be set when creating custom text editing widgets. Qt::WA_KeyboardFocusChange 77 Set on a toplevel window when the users changes focus with the keyboard (tab, backtab, or shortcut). Qt::WA_KeyCompression 33 Enables key event compression if set, and disables it if not set. By default key compression is off, so widgets receive one key press event for each key press (or more, since autorepeat is usually on). If you turn it on and your program doesn't keep up with key input, Qt may try to compress key events so that more than one character can be processed in each event. For example, a word processor widget might receive 2, 3 or more characters in each QKeyEvent::text(), if the layout recalculation takes too long for the CPU. If a widget supports multiple character unicode input, it is always safe to turn the compression on. Qt performs key event compression only for printable characters. Qt::Modifier keys, cursor movement keys, function keys and miscellaneous action keys (e.g. Escape, Enter, Backspace, PrintScreen) will stop key event compression, even if there are more compressible key events available. Platforms other than Mac and X11 do not support this compression, in which case turning it on will have no effect. This is set/cleared by the widget's author. Qt::WA_LayoutOnEntireRect 48 Indicates that the widget wants QLayout to operate on the entire QWidget::rect(), not only on QWidget::contentsRect(). This is set by the widget's author. Qt::WA_LayoutUsesWidgetRect 92 Ignore the layout item rect from the style when laying out this widget with QLayout. This makes a difference in QMacStyle and QPlastiqueStyle for some widgets. Qt::WA_MacNoClickThrough 12 Indicates that the window is only activated when clicked. Qt::WA_MacOpaqueSizeGrip 85 Indicates that the native Carbon size grip should be opaque instead of transparent (the default). This attribute is only applicable to Mac OS X and is set by the widget's author. Qt::WA_MacShowFocusRect 88 Indicates that this widget should get a QFocusFrame around it. Some widgets draw their own focus halo regardless of this attribute. Not that the QWidget::focusPolicy also plays the main role in whether something is given focus or not, this only controls whether or not this gets the focus frame. This attribute is only applicable to Mac OS X.
Qt::WA_MacNormalSize 89 Indicates the widget should have the normal size for widgets in Mac OS X. This attribute is only applicable to Mac OS X.
Qt::WA_MacSmallSize 90 Indicates the widget should have the small size for widgets in Mac OS X. This attribute is only applicable to Mac OS X.
Qt::WA_MacMiniSize 91 Indicates the widget should have the mini size for widgets in Mac OS X. This attribute is only applicable to Mac OS X.
Qt::WA_MacVariableSize 102 Indicates the widget can choose between alternative sizes for widgets to avoid clipping. This attribute is only applicable to Mac OS X.
Qt::WA_MacBrushedMetal 46 Indicates the widget should be drawn in the brushed metal style as supported by the windowing system. This attribute is only applicable to Mac OS X.
Qt::WA_Mapped 11 Indicates that the widget is mapped on screen. This is set/cleared by the Qt kernel. Qt::WA_MouseNoMask 71 Makes the widget receive mouse events for the entire widget regardless of the currently set mask, overriding QWidget::setMask(). This is not applicable for top-level windows. Qt::WA_MouseTracking 2 Indicates that the widget has mouse tracking enabled. See QWidget::mouseTracking. Qt::WA_Moved 43 Indicates that the widget has an explicit position. This is set/cleared by QWidget::move() and by QWidget::setGeometry(). Qt::WA_MSWindowsUseDirect3D 94 Makes drawing to a widget with this attribute set use the Direct3D paint engine, if the Direct3D paint engine is available. This functionality is experimental. Qt::WA_NoBackground WA_OpaquePaintEvent This value is obsolete. Use WA_OpaquePaintEvent instead. Qt::WA_NoChildEventsForParent 58 Indicates that the widget does not want ChildAdded or ChildRemoved events sent to its parent. This is rarely necessary but can help to avoid automatic insertion widgets like splitters and layouts. This is set by a widget's author. Qt::WA_NoChildEventsFromChildren 39 Indicates that the widget does not want to receive ChildAdded or ChildRemoved events sent from its children. This is set by a widget's author. Qt::WA_NoMouseReplay 54 Used for pop-up widgets. Indicates that the most recent mouse press event should not be replayed when the pop-up widget closes. The flag is set by the widget's author and cleared by the Qt kernel every time the widget receives a new mouse event. Qt::WA_NoMousePropagation 73 Prohibits mouse events from being propagated to the widget's parent. Qt::WA_NoSystemBackground 9 Indicates that the widget has no background, i.e. when the widget receives paint events, the background is not automatically repainted. Note: Unlike WA_OpaquePaintEvent, newly exposed areas are never filled with the background (e.g after showing a window for the first time the user can see "through" it until the application processes the paint events). This is set/cleared by the widget's author. Qt::WA_OpaquePaintEvent 4 Indicates that the widget paints all its pixels when it receives a paint event. It is thus not required for operations like updating, resizing, scrolling and focus changes to erase the widget before generating paint events. Using WA_OpaquePaintEvent is a small optimization. It can help to reduce flicker on systems that do not provide double buffer support, and it avoids the computational cycles necessary to erase the background prior to paint. Note: Unlike WA_NoSystemBackground, WA_OpaquePaintEvent makes an effort to avoid transparent window backgrounds. This is set/cleared by the widget's author. Qt::WA_OutsideWSRange 49 Indicates that the widget is outside the valid range of the window system's coordinate system. A widget outside the valid range cannot be mapped on screen. This is set/cleared by the Qt kernel. Qt::WA_PaintOnScreen 8 Indicates that the widget wants to draw directly onto the screen. Widgets with this attribute set do not participate in composition management, i.e. they cannot be semi-transparent or shine through semi-transparent overlapping widgets. This is only supported on X11. On Qt for Embedded Linux, the flag currently only works when set on a top-level widget and relies on support from the active screen driver. The flag is set or cleared by the widget's author. For rendering outside of Qt's paint system; e.g. if you need to use native X11 painting primitives, you need to reimplement QWidget::paintEngine() to return 0 and set this flag. Note: This flag disables double buffering. Qt::WA_PaintOutsidePaintEvent 13 Makes it possible to use QPainter to paint on the widget outside paintEvent(). This is not supported on Windows, Mac OS X or Embedded Linux. We recommend that you use this attribute only when porting Qt 3 code to Qt 4. Qt::WA_PaintUnclipped 52 Makes all painters operating on this widget unclipped. Children of this widget or other widgets in front of it do not clip the area the painter can paint on. This flag is only supported for widgets for which the WA_PaintOnScreen flag is set. The preferred way to do this in a cross platform way is to create a transparent widget that lies in front of the other widgets. Qt::WA_PendingMoveEvent 34 Indicates that a move event is pending, e.g. when a hidden widget was moved. This is set/cleared by the Qt kernel. Qt::WA_PendingResizeEvent 35 Indicates that a resize event is pending, e.g. when a hidden widget was resized. This is set/cleared by the Qt kernel. Qt::WA_QuitOnClose 76 Makes Qt quit the application when the last widget with the attribute set has accepted closeEvent(). This behavior can be adjusted with the QApplication::quitOnLastWindowClosed property. By default the attribute is set for all widgets of type Qt::Window. Qt::WA_Resized 42 Indicates that the widget has an explicit size. This is set/cleared by QWidget::resize() and by QWidget::setGeometry(). Qt::WA_RightToLeft 56 Indicates that the layout direction for the widget is right to left. Qt::WA_SetCursor 38 Indicates that the widget has a cursor of its own. This is set/cleared by QWidget::setCursor() and QWidget::unsetCursor(). Qt::WA_SetFont 37 Indicates that the widget has a font of its own. This is set/cleared by QWidget::setFont(). Qt::WA_SetPalette 36 Indicates that the widget has a palette of its own. This is set/cleared by QWidget::setPalette(). Qt::WA_SetStyle 86 Indicates that the widget has a style of its own. This is set/cleared by QWidget::setStyle(). Qt::WA_ShowModal 70 This attribute has been deprecated. Use QWidget::windowModality instead. Qt::WA_StaticContents 5 Indicates that the widget contents are north-west aligned and static. On resize, such a widget will receive paint events only for the newly visible part of itself. This is set/cleared by the widget's author. Qt::WA_StyleSheet 97 Indicates that the widget is styled using a style sheet. Qt::WA_UnderMouse 1 Indicates that the widget is under the mouse cursor. The value is not updated correctly during drag and drop operations. There is also a getter function QWidget::underMouse(). This is set/cleared by the Qt kernel. Qt::WA_UpdatesDisabled 10 Indicates that updates are blocked (including the system background). This flag must never be set/cleared by the widget author. It is set/cleared by the Qt kernel. Qt::WA_WindowModified 41 Indicates that the window is marked as modified. On some platforms this will mean nothing, on others (including Mac OS X and Windows) the window will take a modified appearance. This is set/cleared by QWidget::setWindowModified(). Qt::WA_WindowPropagation 80 Makes a toplevel window inherit font and palette from its parent. Qt::WA_MacAlwaysShowToolWindow 96 On Mac OS X, show the tool window even when the application is not active. By default, all tool windows are hidden when the application is inactive. Qt::WA_SetLocale 87 Indicates the local should be taken into consideration in the widget. Qt::WA_StyledBackground 93 Indicates the widget should be drawn using a styled background. Qt::WA_ShowWithoutActivating 98 Show the widget without making it active. Qt::WA_NativeWindow 100 Indicates that a native window is created for the widget. Enabling this will also force a native window for the widget's ancestors unless Qt::WA_DontCreateNativeAncestors is set. Qt::WA_DontCreateNativeAncestors 101 Indicates that the widget's ancestors are kept non-native even though the widget itself is native. Qt::WA_X11NetWmWindowTypeDesktop 104 Adds _NET_WM_WINDOW_TYPE_DESKTOP to the window's _NET_WM_WINDOW_TYPE X11 window property. See http://standards.freedesktop.org/wm-spec/ for more details. This attribute has no effect on non-X11 platforms. Qt::WA_X11NetWmWindowTypeDock 105 Adds _NET_WM_WINDOW_TYPE_DOCK to the window's _NET_WM_WINDOW_TYPE X11 window property. See http://standards.freedesktop.org/wm-spec/ for more details. This attribute has no effect on non-X11 platforms. Qt::WA_X11NetWmWindowTypeToolBar 106 Adds _NET_WM_WINDOW_TYPE_TOOLBAR to the window's _NET_WM_WINDOW_TYPE X11 window property. See http://standards.freedesktop.org/wm-spec/ for more details. This attribute has no effect on non-X11 platforms. Note that Qt automaticaly sets this attribute for QToolBar. Qt::WA_X11NetWmWindowTypeMenu 107 Adds _NET_WM_WINDOW_TYPE_MENU to the window's _NET_WM_WINDOW_TYPE X11 window property. See http://standards.freedesktop.org/wm-spec/ for more details. This attribute has no effect on non-X11 platforms. Note that Qt automatically sets this attribute for QMenu when torn-off. Qt::WA_X11NetWmWindowTypeUtility 108 Adds _NET_WM_WINDOW_TYPE_UTILITY to the window's _NET_WM_WINDOW_TYPE X11 window property. See http://standards.freedesktop.org/wm-spec/ for more details. This attribute has no effect on non-X11 platforms. Note that Qt automatically sets this attribute for the Qt::Tool window type. Qt::WA_X11NetWmWindowTypeSplash 109 Adds _NET_WM_WINDOW_TYPE_SPLASH to the window's _NET_WM_WINDOW_TYPE X11 window property. See http://standards.freedesktop.org/wm-spec/ for more details. This attribute has no effect on non-X11 platforms. Note that Qt automatically sets this attribute for the Qt::SplashScreen window type. Qt::WA_X11NetWmWindowTypeDialog 110 Adds _NET_WM_WINDOW_TYPE_DIALOG to the window's _NET_WM_WINDOW_TYPE X11 window property. See http://standards.freedesktop.org/wm-spec/ for more details. This attribute has no effect on non-X11 platforms. Note that Qt automatically sets this attribute for the Qt::Dialog and Qt::Sheet window types. Qt::WA_X11NetWmWindowTypeDropDownMenu 111 Adds _NET_WM_WINDOW_TYPE_DROPDOWN_MENU to the window's _NET_WM_WINDOW_TYPE X11 window property. See http://standards.freedesktop.org/wm-spec/ for more details. This attribute has no effect on non-X11 platforms. Note that Qt automatically sets this attribute for QMenus added to a QMenuBar. Qt::WA_X11NetWmWindowTypePopupMenu 112 Adds _NET_WM_WINDOW_TYPE_POPUP_MENU to the window's _NET_WM_WINDOW_TYPE X11 window property. See http://standards.freedesktop.org/wm-spec/ for more details. This attribute has no effect on non-X11 platforms. Note that Qt automatically sets this attribute for QMenu. Qt::WA_X11NetWmWindowTypeToolTip 113 Adds _NET_WM_WINDOW_TYPE_TOOLTIP to the window's _NET_WM_WINDOW_TYPE X11 window property. See http://standards.freedesktop.org/wm-spec/ for more details. This attribute has no effect on non-X11 platforms. Note that Qt automatically sets this attribute for the Qt::ToolTip window type. Qt::WA_X11NetWmWindowTypeNotification 114 Adds _NET_WM_WINDOW_TYPE_NOTIFICATION to the window's _NET_WM_WINDOW_TYPE X11 window property. See http://standards.freedesktop.org/wm-spec/ for more details. This attribute has no effect on non-X11 platforms. Qt::WA_X11NetWmWindowTypeCombo 115 Adds _NET_WM_WINDOW_TYPE_COMBO to the window's _NET_WM_WINDOW_TYPE X11 window property. See http://standards.freedesktop.org/wm-spec/ for more details. This attribute has no effect on non-X11 platforms. Note that Qt automatically sets this attribute for the QComboBox pop-up. Qt::WA_X11NetWmWindowTypeDND 116 Adds _NET_WM_WINDOW_TYPE_DND to the window's _NET_WM_WINDOW_TYPE X11 window property. See http://standards.freedesktop.org/wm-spec/ for more details. This attribute has no effect on non-X11 platforms. Note that Qt automatically sets this attribute on the feedback widget used during a drag. This enum is used to describe parts of a window frame. It is returned by QGraphicsWidget::windowFrameSectionAt() to describe what section of the window frame is under the mouse. See also QGraphicsWidget::windowFrameEvent(), QGraphicsWidget::paintWindowFrame(), and QGraphicsWidget::windowFrameSectionAt(). This enum specifies the behavior of a modal window. A modal window is one that blocks input to other windows. Note that windows that are children of a modal window are not blocked. Qt::NonModal 0 The window is not modal and does not block input to other windows. Qt::WindowModal 1 The window is modal to a single window hierarchy and blocks input to its parent window, all grandparent windows, and all siblings of its parent and grandparent windows. Qt::ApplicationModal 2 The window is modal to the application and blocks input to all windows. See also QWidget::windowModality and QDialog. This enum type is used to specify the current state of a top-level window. Qt::WindowNoState 0x00000000 The window has no state set (in normal state). Qt::WindowMinimized 0x00000001 The window is minimized (i.e. iconified). Qt::WindowMaximized 0x00000002 The window is maximized with a frame around it. Qt::WindowFullScreen 0x00000004 The window fills the entire screen without any frame around it. Qt::WindowActive 0x00000008 The window is the active window, i.e. it has keyboard focus. The WindowStates type is a typedef for QFlags<WindowState>. It stores an OR combination of WindowState values. This enum type is used to specify various window-system properties for the widget. They are fairly unusual but necessary in a few cases. Some of these flags depend on whether the underlying window manager supports them. Qt::Widget 0x00000000 This is the default type for QWidget. Widgets of this type are child widgets if they have a parent, and independent windows if they have no parent. See also Qt::Window and Qt::SubWindow. Qt::Window 0x00000001 Indicates that the widget is a window, usually with a window system frame and a title bar, irrespective of whether the widget has a parent or not. Note that it is not possible to unset this flag if the widget does not have a parent. Qt::Dialog 0x00000002 | Window Indicates that the widget is a window that should be decorated as a dialog (i.e., typically no maximize or minimize buttons in the title bar). This is the default type for QDialog. If you want to use it as a modal dialog, it should be launched from another window, or have a parent and used with the QWidget::windowModality property. If you make it modal, the dialog will prevent other top-level windows in the application from getting any input. We refer to a top-level window that has a parent as a secondary window. Qt::Sheet 0x00000004 | Window Indicates that the widget is a Macintosh sheet. Qt::Drawer 0x00000006 | Window Indicates that the widget is a Macintosh drawer. Qt::Popup 0x00000008 | Window Indicates that the widget is a pop-up top-level window, i.e. that it is modal, but has a window system frame appropriate for pop-up menus. Qt::Tool 0x0000000a | Window Indicates that the widget is a tool window. A tool window is often a small window with a smaller than usual title bar and decoration, typically used for collections of tool buttons. It there is a parent, the tool window will always be kept on top of it. If there isn't a parent, you may consider using Qt::WindowStaysOnTopHint as well. If the window system supports it, a tool window can be decorated with a somewhat lighter frame. It can also be combined with Qt::FramelessWindowHint. Qt::ToolTip 0x0000000c | Window Indicates that the widget is a tooltip. This is used internally to implement tooltips. Qt::SplashScreen 0x0000000e | Window Indicates that the window is a splash screen. This is the default type for QSplashScreen. Qt::Desktop 0x00000010 | Window Indicates that this widget is the desktop. This is the type for QDesktopWidget. Qt::SubWindow 0x00000012 Indicates that this widget is a sub-window, such as a QMdiSubWindow widget. Qt::MSWindowsFixedSizeDialogHint 0x00000100 Gives the window a thin dialog border on Windows. This style is traditionally used for fixed-size dialogs. Qt::MSWindowsOwnDC 0x00000200 Gives the window its own display context on Windows. Qt::X11BypassWindowManagerHint 0x00000400 Bypass the window manager completely. This results in a borderless window that is not managed at all (i.e., no keyboard input unless you call QWidget::activateWindow() manually). Qt::FramelessWindowHint 0x00000800 Produces a borderless window. The user cannot move or resize a borderless window via the window system. On X11, the result of the flag is dependent on the window manager and its ability to understand Motif and/or NETWM hints. Most existing modern window managers can handle this. The CustomizeWindowHint flag is used to enable customization of the window controls. This flag must be set to allow the WindowTitleHint, WindowSystemMenuHint, WindowMinimizeButtonHint and WindowMaximizeButtonHint flags to be changed. Qt::CustomizeWindowHint 0x02000000 Turns off the default window title hints. Qt::WindowTitleHint 0x00001000 Gives the window a title bar. Qt::WindowSystemMenuHint 0x00002000 Adds a window system menu, and possibly a close button. Qt::WindowMinimizeButtonHint 0x00004000 Adds a minimize button. On some platforms this implies Qt::WindowSystemMenuHint for it to work. Qt::WindowMaximizeButtonHint 0x00008000 Adds a maximize button. On some platforms this implies Qt::WindowSystemMenuHint for it to work. Qt::WindowMinMaxButtonsHint WindowMinimizeButtonHint | WindowMaximizeButtonHint Adds a minimize and a maximize button. On some platforms this implies Qt::WindowSystemMenuHint for it to work. Qt::WindowContextHelpButtonHint 0x00010000 Adds a context help button to dialogs. On some platforms this implies Qt::WindowSystemMenuHint for it to work. Qt::WindowStaysOnTopHint 0x00040000 Informs the window system that the window should stay on top of all other windows. Note that on some window managers on X11 you also have to pass Qt::X11BypassWindowManagerHint for this flag to work correctly. Qt::WindowOkButtonHint 0x00080000 Adds an OK button to the window decoration of a dialog. Only supported for Windows CE. Qt::WindowCancelButtonHint 0x000100000 Adds a Cancel button to the window decoration of a dialog. Only supported for Windows CE. Qt::WindowType_Mask 0x000000ff A mask for extracting the window type part of the window flags. Qt::WMouseNoMask 0x00080000 Use Qt::WA_MouseNoMask instead. Qt::WDestructiveClose 0x00100000 Use Qt::WA_DeleteOnClose instead. Qt::WStaticContents 0x00200000 Use Qt::WA_StaticContents instead. Qt::WGroupLeader 0x00400000 No longer needed. Qt::WShowModal 0x00800000 Use QWidget::windowModality instead. Qt::WNoMousePropagation 0x01000000 Use Qt::WA_NoMousePropagation instead. Qt::WType_TopLevel Window Use Qt::Window instead. Qt::WType_Dialog Dialog Use Qt::Dialog instead. Qt::WType_Popup Popup Use Qt::Popup instead. Qt::WType_Desktop Desktop Use Qt::Desktop instead. Qt::WType_Mask WindowType_Mask Use Qt::WindowType_Mask instead. Qt::WStyle_Customize 0 No longer needed. Qt::WStyle_NormalBorder 0 No longer needed. Qt::WStyle_DialogBorder MSWindowsFixedSizeDialogHint Use Qt::MSWindowsFixedSizeDialogHint instead. Qt::WStyle_NoBorder FramelessWindowHint Use Qt::FramelessWindowHint instead. Qt::WStyle_Title WindowTitleHint Use Qt::WindowTitleHint instead. Qt::WStyle_SysMenu WindowSystemMenuHint Use Qt::WindowSystemMenuHint instead. Qt::WStyle_Minimize WindowMinimizeButtonHint Use Qt::WindowMinimizeButtonHint instead. Qt::WStyle_Maximize WindowMaximizeButtonHint Use Qt::WindowMaximizeButtonHint instead. Qt::WStyle_MinMax WStyle_Minimize | WStyle_Maximize Use Qt::WindowMinMaxButtonsHint instead. Qt::WStyle_Tool Tool Use Qt::Tool instead. Qt::WStyle_StaysOnTop WindowStaysOnTopHint Use Qt::WindowStaysOnTopHint instead. Qt::WStyle_ContextHelp WindowContextHelpButtonHint Use Qt::WindowContextHelpButtonHint instead. Qt::WPaintDesktop 0 No longer needed. Qt::WPaintClever 0 No longer needed. Qt::WX11BypassWM X11BypassWindowManagerHint Use Qt::X11BypassWindowManagerHint instead. Qt::WWinOwnDC MSWindowsOwnDC Use Qt::MSWindowsOwnDC instead. Qt::WMacSheet Sheet Use Qt::Sheet instead. Qt::WMacDrawer Drawer Use Qt::Drawer instead. Qt::WStyle_Splash SplashScreen Use Qt::SplashScreen instead. Qt::WNoAutoErase 0 No longer needed. Qt::WRepaintNoErase 0 No longer needed. Qt::WNorthWestGravity WStaticContents Use Qt::WA_StaticContents instead. Qt::WType_Modal Dialog | WShowModal Use Qt::Dialog and QWidget::windowModality instead. Qt::WStyle_Dialog Dialog Use Qt::Dialog instead. Qt::WStyle_NoBorderEx FramelessWindowHint Use Qt::FramelessWindowHint instead. Qt::WResizeNoErase 0 No longer needed. Qt::WMacNoSheet 0 No longer needed. The WindowFlags type is a typedef for QFlags<WindowType>. It stores an OR combination of WindowType values. See also QWidget::windowFlags and Window Flags Example. Converts the plain text string plain to an HTML-formatted paragraph while preserving most of its look. mode defines how whitespace is handled. This function is defined in the <QTextDocument> header file. See also escape() and mightBeRichText(). Converts the plain text string plain to a HTML string with HTML metacharacters <, >, and & replaced by HTML entities. QString plain = "#include <QtCore>"
// html == "#include &lt;QtCore&gt;"
See also convertFromPlainText() and mightBeRichText().